Pinpoint pain (pain at the place of impact) at the time the fracture occurs and perhaps for a few hours later, but often the pain goes away after several hours. Stress fractures are tiny hairline breaks usually caused by repetitive stress. Stress fractures often afflict athletes who, for example, too rapidly increase their running mileage. They can also be caused by an abnormal foot structure, deformities or osteoporosis. Improper footwear may also lead to stress fractures. Stress fractures should not be ignored. They require proper medical attention to heal correctly. 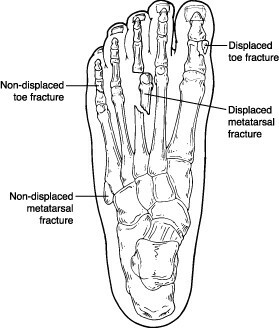 For example, sometimes a fracture of the first metatarsal bone (behind the big toe) can lead to arthritis. Since the big toe is used so frequently and bears more weight than other toes, arthritis in that area can make it painful to walk, bend or even stand. Immobilization, casting or rigid shoe. A stiff-soled shoe or other form of immobilization may be used to protect the fractured bone while it is healing. Use of a postoperative shoe or bootwalker is also helpful.